GUMNUTS.....AND OTHER STUFF: Narrabeen Lagoon Trail with L, L, L, L and J. 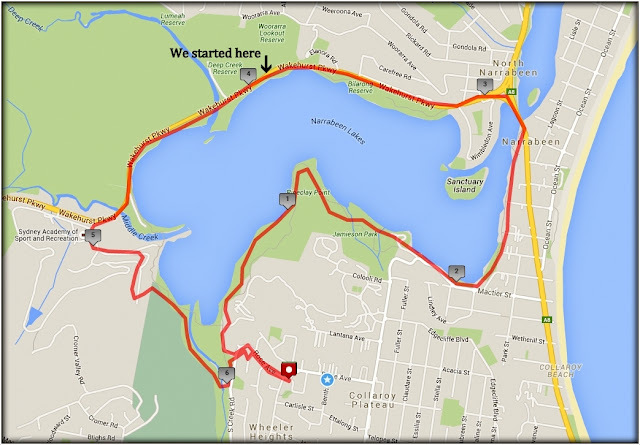 On this cool, but dry day the 3 siblings, and our partners, walked just over 9 km's around Narrabeen Lagoon. A cool jacket start to the walk. Pedestrian bridge, on the left, and road bridge. A Black Swan finds the lake a bit too shallow to swim. I had this view all day. The Brush Turkey is almost becoming 'Sydney's Bird'. Dr. Gus (I'll pull your teeth out) Jones B.D.S (Best Dental Surgeon). Sleeping tooth about to be crushed by a toothbrush. Must be getting close to lunch time. White Cockatoo having its lunch. .....and this Eget was looking for its lunch. This friendly fellow just wanted to play. Couldn't get much out of this fellow (I think he was 'stoned'). What's the point of growing up?